This Wednesday, 26 April, we welcome the New Moon in Taurus. This is a good opportunity to review our finances and work out the practical aspects of future-planning. Organise your budget, streamline your expenditure, re-structure a debt payment plan… On the flip side of the coin, maybe it’s time to talk to your manager about that raise, start on an investment plan, or put up your spare room for Airbnb rental! As a Number 1 Year, 2017 is the Year of Intentions. It’s time to set intentions about how you want your financial future to pan out, and take action accordingly. The motto of Taurus is “I Have”. 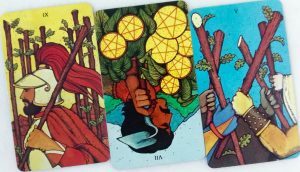 So if you’re planning to set intentions during the New Moon in Taurus, the question to ask is, “What do I value in the physical realm?” Financial independence? Early retirement? Freedom from debt? A villa in the Bahamas? LEFT: NINE OF RODS. This week gets busy. The Nine of Rods is sometimes known as the Card of the Wounded Soldier – lots of fires to put out, and almost endless battles to fight. With warlike Mars in excitable Gemini, some folks might get pushy, snappish and/or easily distracted. It’s a great opportunity to practice some Zen principles and calmly, but firmly, draw boundaries around your personal space and time. calmly, but firmly, draw boundaries around your personal space and time. MIDDLE: SEVEN OF PENTACLES REVERSED. The Seven of Pentacles depicts a farmer, having done the needful, now patiently awaiting the harvest. Upside-down, it’s a warning against impatience. It’s also a gentle reminder to check the work you’ve done, tweak what needs improvement, and catch up with the schedule if you’ve been falling behind. This is Taurus season, darlings – time to put our noses to the grind. Taurus season, darlings – it’s time to put our noses to the grind. RIGHT: FIVE OF RODS. This card is frequently associated with petty drama – think Mean Girls and all that bitchy office gossip your besties gleefully spam your WhatsApp group chats with (and that you read just as gleefully). Working with Queen bees and wannabes can be challenging; with Pluto in retrograde, the inner ugliness of the Plastics in your school, office, or social circle could very well explode spectacularly. Again, the advice is to stay calm and firm. Draw your boundaries, and guard them well. Remember that the Pluto retrograde might surface your own shadow self, so be accordingly mindful if you notice your not-so-pleasant qualities becoming more apparent. be accordingly mindful if you notice your not-so-pleasant qualities becoming more apparent. The Pluto retrograde is simply the Universe’s way of reflecting our hidden truth to ourselves, teaching us humility so our egos won’t lead us astray, and guiding us towards the achievement of our full potential. Hang tight and have a great week ahead!